Currently viewing the tag: "repair"
Warranty handling is where companies lose money but make names. 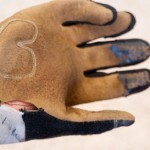 I had a chance to experience Dakine’s Warranty process with a pair of Step-Up Gloves purchased and reviewed earlier this year. Overall my warranty claim with Dakine was a positive experience. There was no unnecessary jumping through hoops or arguing over the fine print.